For more than twenty years, I have enjoyed the novels penned by Victoria Alexander. Her rich descriptions, intriguing characters, lively banter, depth of emotion, and sense of humor frequently land her books on my must-buy list. 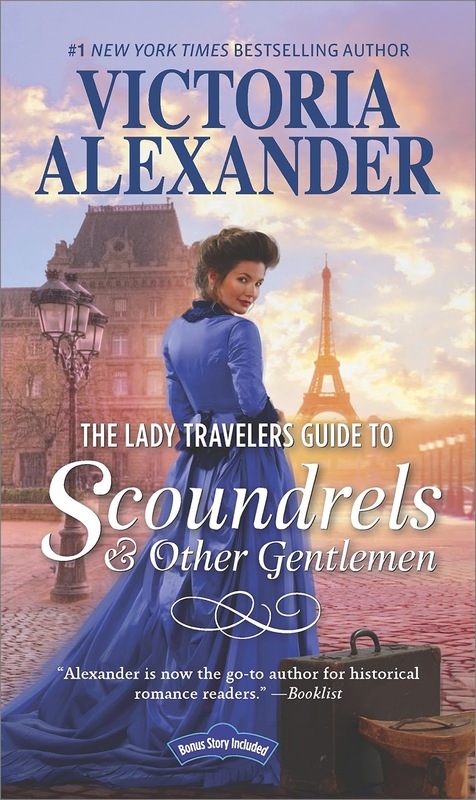 I've been looking forward to her new historical romance series about lady travelers since first hearing about it last fall. Derek Saunders has thoroughly enjoyed his single lifestyle but it's time to pay the piper. His uncle, the Earl, to whom Derek is heir, has reined him in. It's time to learn how to manage the earldom and leave scandal behind. Thus, when Derek discovers his elderly aunt and her two best friends, all widows, are running a lady travelers organization that might be just a wee bit shady and one of their travelers has gone missing (a scandal in the making), his first thought is to find the missing woman and steer the ladies back onto the straight and narrow before their misdeeds become public knowledge and land them in jail. He doesn't expect the missing woman's annoying cousin to be part of the deal. India Prendergast is a self-righteous, uptight, independent, opinionated, woman who is always right, at least in her own mind. She's also worried sick about the cousin who took her in and raised her after India's missionary parents died. 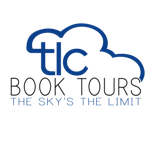 India is also highly suspicious of the Lady Travelers group that planned her cousin's trip and certain that Derek Saunders is the behind-the-scenes mastermind who is taking advantage of his sweet, elderly aunt while stealing money from the group's unsuspecting members. Even though India sees no good reason for anyone to ever leave England, her cousin did, and she's not about to let Derek embark on a search for her cousin without her, dishonest rogue that he is...or so she believes. The first half of this book is a little slow and, I have to admit, I found the heroine extremely unlikable early on but don't give up. Once we hit the mid-point, things really pick up and we begin to discover the hidden facets of both India and Derek. India, in particular, embarks not only on a journey to Paris to search for her cousin but on a much more important, though unplanned, journey of self-discovery. At several points along the way, through interactions with others, some poignant and others, humorous, she's forced to view herself as others see her and, slowly, she begins to evolve and change, a butterfly emerging, both externally and internally, from a cocoon of her own making. Derek has always been a charming scamp but he too evolves during their time in Paris and discovers that the most important things in life often are those that require the most effort. He has a good heart and protective instincts. I loved his relationship with his family as well as the slow, organic progression of his relationship with India. I also thoroughly enjoyed the snappy banter between Derek and India. Each gives as good as they get! The secondary characters are a delight and add much to the story: from the elderly ladies to Derek's stepbrother, Val (I do hope we see more of him in a future book), to their mother, her husband, and Derek's uncle. It was especially enjoyable, after reading this book, to then meet Derek's mother, uncle, aunt, and her friends in their younger years in the novella prequel, The Proper Way to Stop a Wedding (in Seven Days or Less). 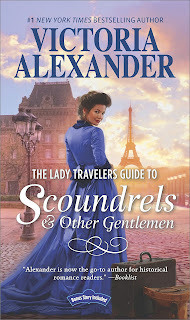 As a lady who loves to travel, I'm looking forward to the next installment in Victoria Alexander's Lady Travelers series, The Lady Travelers Guide to Larceny With a Dashing Stranger, due to be released this November. This one features a desperate widow, a determined bachelor, and a search for a missing masterpiece amidst the romance of Venice, Italy. I'll be there! I am quite intrigued by this book and look forward to reading it. I agree that Victoria Alexander writes some great stories. Hope you enjoy it, Connie. I think this series has the potential to be a lot of fun. Thanks for the review - nice to know that it picks up as you go. I think a lot of first books in a new series start out slow as there's the stage to set, characters to introduce, etc. It picks up once our main characters reach Paris though and I ended up really enjoying it. This sounds enjoyable. I like stories that employ travel, a road trip as a plot element. It add a few elements that aren't possible in a regular "stay at home" plot. Thank you for the review. Independent lady travelers, I will look forward to reading her new series. I recently enjoyed The Scandalous Adventures of the Sister of the Bride. I have some catching up to do. I just love the title of this book! I'm glad to see that what's inside is just as good.